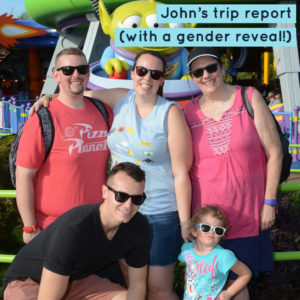 John recently returned from Disney World with his family which included finding out if he and his wife are having a boy or a girl. Find out how they learned that, plus get a quick tip about making it easier to enter the park turnstiles with little ones. "I was fortunate enough to tag along on a trip to Walt Disney World with my 4 nieces and nephews this past May. I noticed we started wasting a lot of time at the turnstiles because my nieces and nephews couldn’t remember which hand they used to tap their finger to gain entrance to the park. I started using a saying with them: Magic band, magic hand! That is to say, whatever wrist their magic band was on, that was the hand they should use their pointer finger to scan at the turnstiles. We were lucky because they all had their bands on their right hands and used their right pointer finger, but I imagine using this phrase from the first day of our trip would have kept things flowing easier."